Despite picking at the back end of the first round in the upcoming NFL draft, the Minnesota Vikings will still have plenty of talented prospects to choose from. It's the downside of having a successful season but compared to most teams, the Vikings have little to no holes to fill on their roster. But nevertheless, they're still getting a look at all of the top prospects before draft night. Rick Spielman and the team are busy with pre-draft visits as Georgia linebacker Lorenzo Carter heads to Minneapolis. Big visit day for the #Vikings: Along with #UT OT Connor Williams, they have #ND OT Mike McGlinchey, #Stanford S Justin Reid, and #UGA LB Lorenzo Carter in today. #Memphis WR Anthony Miller is there tomorrow. Fellow linebacker and teammate Roquan Smith has stolen most of the draft attention the offense but Carter isn't a prospect to be ignored. 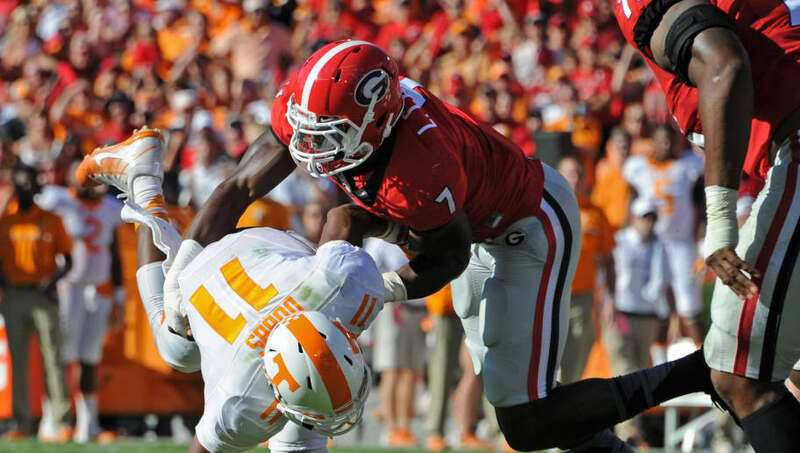 He put together four very productive years at Georgia, finishing the 2017 season with 62 tackles and 4.5 sacks. Carter is projected to land on Day 2 and has drawn comparisons to Bears' pass rusher Leonard Floyd. At 250-pounds, Carter clocked a 4.5-second 40-yard dash at the NFL Combine, which caught the eyes of scouts and front office executives alike. The Vikings already possess a talented linebacker core of Anthony Barr and Eric Kendricks and adding Carter would give the defense much-needed depth at the position. On to the second round which brings me to my two draft crushes..
To fill the B-Rob vacancy. Both of these players to me are a home run!! And not only will fill in for B-Rob but serve as an outstanding backup for Ever and EVEN Barr! Carter provides excellent value in the mid-rounds and could be too much for the Vikings to pass up on this offseason.